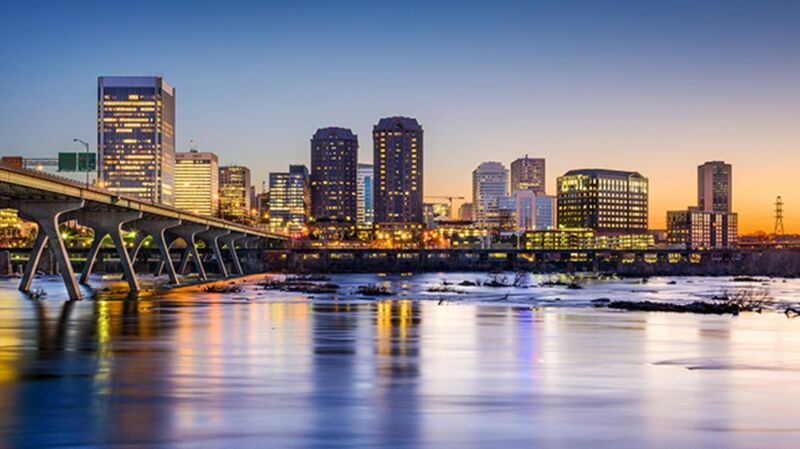 Richmond, Virginia has the rather placid nickname of "River City," but its neighborhoods sport some more unusual nicknames, like "Shockoe Slip" and "Three Chopt." Here’s how seven of the more memorable districts in Virginia’s capital city got their names. Filled with staid government buildings—including the Virginia State Capitol, Executive Mansion, and the White House of the Confederacy—Court End is a historic district that carries reminders of Richmond’s brief role as the Confederate capital. For the story behind its name, look no further than the Supreme Court of Virginia, which is located near the Virginia State Capitol building. The U.S. District Court is nearby, too, which means the judicial branch is especially well-represented in Court End. The word Shockoe has a pleasant sound and old roots. It’s a nod to the city’s Shockoe Creek, whose name derives from Shacahocan—a Powhatan/Algonquin phrase that referred to a flat rock at the mouth of the creek. Shockoe Slip was once a trading post, and the “slip” is where boats loaded their cargo. The area eventually became the commercial center of Richmond. The trade had a brutal side in nearby Shockoe Bottom, which was the center of Richmond’s slave trade. Home to slave jails like the one where 12 Years a Slave’s Solomon Northup was imprisoned, much of Shockoe Bottom has since been paved over along with the creek that inspired its name. One of Richmond’s most beautiful neighborhoods, The Fan is so named because of the fan-like way some of its streets radiate out from Monroe Park. And if you’re an architecture nerd, you might need to fan yourself while you explore: It’s full of vintage homes in all kinds of architectural styles. But The Fan didn’t always have its name. At first, part of it was known as Scuffletown, likely because of that time a post-treason Benedict Arnold raided Richmond and scuffled with its militia in 1781. Then, rich people began to build pretty houses around Scuffletown, and in 1817 a town called “Sydney” was planned. Alas, Sydney never came to be. The Fan grew out of the remains of Scuffletown and Sydney, and was eventually defined by its roads. Once known as the “Black Wall Street,” Jackson Ward used to be ground zero for local African-American business institutions. A haven for free blacks before the Civil War, it blossomed into a thriving African-American neighborhood after the war’s end. The reason behind its name is something of a mystery, however. A popular guess is that the area was named by Ulysses S. Grant in 1871 after Andrew Jackson, since other wards were already named after Jefferson, Madison, and Monroe. But another theory contends that the area was named after Jackson’s Garden, a Union College professor’s English-style garden. Regardless of how it was named, Jackson Ward gained fame for its thriving African-American community, which was home to strong banks, businesses, and world-class entertainment. After an urban renewal effort and Virginia’s desegregation, the neighborhood declined as residents moved elsewhere in the city. However, in recent years it has revived and is now a historic district. Like so many things in Virginia, Three Chopt, one of Richmond’s West End neighborhoods, has Colonial roots. In this case, that root is a route called Three Notch’d Road, which was once the main drag connecting east and central Virginia. The road got its name from the three marks settlers cut into trees while they were turning the Native American trail into a full-blown thoroughfare [PDF]. Its other name? Three Chopt (Chopped) Road, which is the one that stuck. Richmond was supposedly built on seven hills, like Rome (though which seven should be considered “official” in Richmond is still a matter of debate). Many of these hills give neighborhoods their names. Libby Hill got its name from an infamous Richmonder, Luther Libby, who lived nearby. Captain Libby was a prominent landowner in the area, but is perhaps best known for a prison that bore his name. (He had nothing to do with the prison itself, but had leased the building when it was a warehouse, and a sign with his name on it wasn't taken down when the building was hurriedly converted to a Confederate prison.) Libby Prison housed Union POWs during the Civil War and was known for both its hellish living conditions and a daring prisoner escape in 1864, when 109 prisoners fled via a tunnel. Libby Hill is also known for giving the whole town of Richmond its name, when people standing on the hill looked over the land and decided it reminded them of Richmond-upon-Thames, England. Carytown came by its reputation as a shopping district honestly: It was the site of the city’s first strip mall. It’s named after Cary Street, which was in turn named after a man named Colonel Archibald Cary. One of Virginia’s richest men, Cary was friends with George Washington and Thomas Jefferson, and was known for helping the rogue colonies establish—and finance—their own government. He made all that cash from flour mills, a foundry, and a plantation that enslaved hundreds. Despite those historic roots, Carytown has only been known by that name since the 1970s, when residents voted to name it after its main drag.